I read the first page* of Ulysses today. Hopefully, you did too. I tweeted while I read it, which was not easy. Keeping “insights” to under 140 characters at a time is not conducive to literary analysis. It also took me less than 2 hours to read the page. I do not recommend this at all. Going forward, I’m going to tweet just once after every page I finish. For what it’s worth, here’s all the tweet action today, with some links added. So, let’s take stock of what happens on page 1. Buck comes to the top of the tower, where he’s living with Stephen. He brings a bowl of lather, a razor, and a mirror, supposedly to shave. He’s still in his yellow(ed?) pajamas. Before he begins to shave, Buck makes fun of Catholic ritual and Stephen (with a bunch of weird, not-funny jokes) while posing as a loud-mouthed, decadent authority figure. He intonation to God parallels to invocation to the muse at the beginning of the Odyssey. He calls horsefaced Stephen up to the top of tower. Stephen just stares, probably just waking up, and probably annoyed that he was woken up to watch this dude shave. This is probably the roommate situation from hell. Their residence here is based Joyce’s own brief unhappy residence at Martello Tower, built a century earlier to defend Dublin against a possible Napoleonic invasion. It was 40 ft high with thick walls. It’s single door was 10 ft off the ground, only reached by rope ladder. Sounds like fun, but that rope ladder would get old quick. Joyce lived there with Oliver Joseph St John Gogarty(who is now immortalized as the inspiration for Buck Mulligan). According to the Ellman biography, Joyce had a pretty unfortunate roommate situation living with Gogarty, who was sarcastic, a drunk, and probably really disrespectful of Joyce’s space. I’m imagining Taco Bell wrappers everywhere. The setting of the top of the tower also recalls Hamlet (act 1, scene 5), where Hamlet confronts the ghost of his father. Stephen definitely thinks of himself as a more Hamlet figure than a Telemachus one. And just coming off our funmaries, so would I. Who whistles back to Buck? Is this just the wind? Who’s the narrator here? It’s definitely 3rd, but not necessarily omniscient or objective. Definitely seems to have it in for Buck. What exactly does it mean to have *untonsured* hair? What are the significance similarities/differences between Hamlet and Telemachus? Is Buck’s reference to the feminine Christ a subtle nod to Dan Brown’s work? 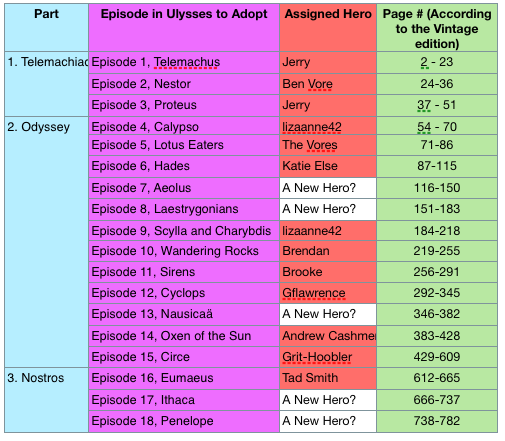 Adopt-An-Episode Update: We’re only have a little over a third of the episodes in Ulysses adopted. Please find it in your heart to become a parent! NEXT: I will read 10 pages and post tomorrow! Adopt-An-Episode or they will die! * = Technically, I read the first 2 pages of Ulysses. Page 1 just has a big letter and 2 words. First of all, my apologies to the millions of followers who were anxiously waiting with bated breath on Saturday for OF #16. 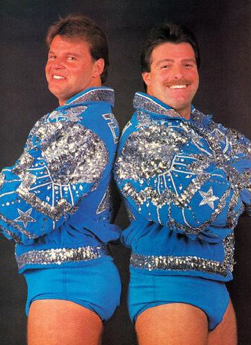 As I mentioned to Jerry, I ran into a bit of a perfect storm this weekend. Octogenerians, my 5-week old nephew, a hot air balloon race, 2 hours of traffic, a 1929 Model A, a parade, my parents’ dial-up modem, and a bourbon tasting all contributed to my tardiness. Luckily, I only had to cover 67 books in this post! So, with that being said, I’ll attempt to quickly (in bullet point no less!) touch on the major points of books 13-16, and then spend a few words on Eumaeus, one of the more intriguing characters that we’ve come across so far in The Odyssey. Odysseus (finally!) finishes telling Alkinoos et al. of all that he has gone through in his attempts to return to his homeland of Ithaca. Having been hooked up with some sweet new tripods and cauldrons, not too mention a nice long nap, O. is whisked back to Ithaca by the Phaiakians, and dumped on his native shore. Odysseus awakens on the beach, unfamiliar with the island from which he has been away from for so long. Athena (the ultimate spoiler) appears, disguised as a shepherd. O. tries to conceal his true identity, which prompts A. to reveal hers. O. asks A. what she thought about this season of Lost. A. promplty tells him how the show will end. A. catches O. up to speed regarding Telemachus’ journey and the suitors’ tomfoolery. A. disguises O. as a beggar, and sends him to see Eumaeus, his old friend and swineherd. Odysseus arrives at Eumaeus’ hut, and is almost torn to shreds by Eumaeus’ dogs. E. invites O. in, feeds him, and offers him shelter. E. extols all the virtues of his master, as O. listens in disguise. O. predicts that O. will soon return to Ithaca. E. is skeptical, as he has heard many men make the very same claims. Most of the time, these men are beggars looking for charity in exchange for a promising word on O. In order to further conceal his true identity, O. tells E. a fabricated story about his experiences with O. during the Trojan War. O. *shockingly* uses this story as another opportunity to let any and everyone listening know how awesome O. is. Athena hightails it to Sparta, and hints to Telemachus that it’s probably time to head back to Ithaca. She warns him of the suitors’ ambush, and instructs him to visit Eumaeus. T. leaves Sparta with a wine cup, a winebowl, a robe, and a sweet t-shirt. But not before everyone witnesses an eagle soaring through the air with a goose in its clutches, which obviously means Odysseus is back. T. picks up a hitchhiker named Theoklymenos, who apparently happens to be a prophet and an augur. Convenient, no? Meanwhile, back at Eumaeus’ hut, Odysseus tests E. hospitality by offering to leave, and no longer be a burden. E. scoffs at this idea, and proceeds to tell O. the his life story. E. is a prince. Who’d thunk it? Telemachus arrives at Eumaeus’ hut to find E. talking with his father, still in disguise. E. leaves to tell Penelope that T. has returned. Athena meets O. outside, where she removes his beggar’s disguise. O. re-enters the hut, revealing his true identity to his son, T.
Reunited, O. & T. devise a plan to defeat the suitors. O. will come to the palace disguised as a beggar while T. hides all of the weapons from the suitors. Then they will take up the hidden weapons and kill the suitors. It is in Book XIV that we are introduced to Eumaeus. He’s a character that, frankly, after my first reading, I sort of expected to fade back into the background of the story. But Eumaeus has some staying power that we haven’t really seen so far in the Odyssey (at least for someone mortal or not named Odysseus or Telemachus). If we were casting “The Odyssey,” Eumaeus would be played by the revered, veteran actor whose performance sticks with you even as a minor part. Think Charlton Heston as the player king in Hamlet. On multiple occasions, Homer addresses Eumaeus in the second person. He is the only character addressed in such a way. It’s a bit curious, and may subconsciously play a part in why I like Eumaeus so much. Homer’s choice to address him as “you, Eumaeus” subtly makes his character more real. Couple that with my (and Ben’s) newfound disillusion with Odysseus, and it’s easier to relate to Eumaeus. It’s hard not to develop an affinity for Eumaeus as he proves to be somewhat of an anchor throughout Odysseus’ long-awaited homecoming. Not only that, but his woodland hut is ground zero for all the planning and scheming on how to facilitate this homecoming. He’s a god-fearing, cynical, loyal, humble, swineherd who waits year after year for his master’s return. As you may have guessed, Eumaeus had to be a Cubs’ fan. Eumaeus, maybe this is the year…..
Will there be an Eumaeus in Ulysses? Will he or she be as likable? What’s up with all the disguises and concealment? Is there an augur union? Does anybody else miss Andre Dawson? Hot air balloon races be damned!!! Let me start this funmary by saying … and this probably doesn’t have much to do with our Ulysses reading (but a helluva more relevant than Ben’s Nestor, the Long-Eared Donkey reference) … that this Helen of Troy person is one piece of work. Events proceed according to Athena’s most ridiculous plan ever (Athena, *not* the goddess of efficiency optimization). Telemachus and Nestor’s son Pisistratus (who was probably itching to get away from the old windbag) arrive in Sparta to visit with Menelaus and *maybe* learn about Odysseus. Ajax … Dean Martin … maybe? (self-destructive dope). Achilles, Agamemnon, Odysseus, and Ajax…Live at the Sands! So Telemachus and Pisistratus show up at Menelaus’ palace while he’s hosting a double wedding feast for both his son “hardy” Megapenthes (quite a name) and his daughter. And in ancient Greece, when you have uninvited guests, you’re pretty much expected to drop everything. Double wedding feast plans be damned. The film reputedly inspired by the road trip Telemachus and Pisistratus take to the kingdom of Sparta. So Telemachus and Pisistratus derail this double wedding, and instead of celebrating the the brides and grooms, Menelaus throws a dinner honoring the wedding crashers. Athena is still with them, and still dressed like a dude. At the dinner, Helen comes prancing in from her “scented, lofty chamber.” This lady ran off with Orlando Bloom to Troy, which was used as a pretext to start the largest war in all antiquity, with countless lives, years, and resources wasted, and who is basically the reason Odysseus is stranded on some island with a horny nymph and Ithaca is without its king. How does she act, now that’s she back with Menelaus? Like a piece of work. At first, she seems to show the appropriate shame for all the death and destruction, by denouncing herself a “shameless whore.” But before they can really grasp the scope of loss she is responsible for (just as Pisistratus breaks down in tears while retelling the story of his brother’s death at Troy), she loads them all up on “magic to make us all forget our pains” (valium?). More appropriately, it’s magic to make them forget all the pains she caused. With everyone strung out on valium, Helen tells everyone that at Troy she knew all about Odysseus’ horse trick, but decided not to tell the Trojans or her lover because, “my heart had changed by now…I yearned to sail back home again!” And then she blames Aphrodite for luring her out to Troy. And Menelaus, good sport that he is, seems to call her b.s. (well-acquainted with it as he must be by now), telling another story about how when the Archaeans were hiding in the wood horse after it was brought into Troy, Helen paraded around it calling their names out, putting at risk the entire mission. What do you want, lady? The night ends, the guests are oiled up and bedded. The next dawn (which is invariably rose-red fingered I’m finding) Telemachus and Menelaus get some alone time. Telemachus asks if Menelaus knows anything about his dad (like does he really have to ask?). Here, Menelaus tells him the story of Proteus, which is of essential significance to Ulysses. On the trip back from Troy, Menelaus says that his ship was stranded by a calm sea and everyone was starving (I’m sure old Helen was doing fine). They go onshore to a nearby rocky island Pharos, where Menelaus runs into, and starts complaining to, Eidothea, daughter of Proteus (some sort of sea God that sleeps with seals). She tells him if he’s able to hold down Proteus when he comes out of the sea (to go sleep with his seals), Proteus will tell him why he’s stranded and anything else he wants. So Menelaus dresses like a seal and and gets the drop seal-loving Proteus. Proteus starts spilling the beans on the post-Trojan War deaths of Ajax and Brian Cox…er, Agamemnon (i.e., the Clytemnestra fiasco), and tells him about Odysseus stranded with the nymph. Doomed Agamemnon (Brian Cox) and cuckolded Menelaus (Brendan Gleeson) give each other face time in 2004’s “Troy” (which was not that bad, btw). Proteus also tells Menelaus that his own future is secured. Since he has Helen now (who is a daughter of Zeus), the gods will make sure he lives on easy street. No wonder Menelaus puts up with Miss Thang. Telemachus is grateful for the story and announces he needs to get back to Ithaca. Menelaus gives him a bowl. Back at Ithaca, the couch-surfing slobs realize Telemachus has been away. (Why this is a surprise after Telemachus announced that he was going away is further evidence of their doomed ineptitude.) 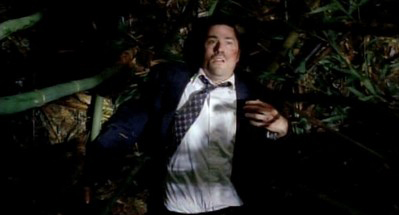 They decide to get a ship together and kill him on his return. Penelope finds out and is worried. But Athena has the message delivered that Telemachus will be fine. Are we allowed to feel any suspense reading this thing? We read page 1 of Ulysses in 16 days! Be a good person and join Wandering Rocks!